On Saturday May 6th we had a large group of ladies that participated (pictured below)! They worked on houses #31 and #32, and accomplished so much during our short time together! Thank you to Lowe's for sponsoring this event! Forty-five volunteers came together Saturday, April 30th to empower one another, to make an impact and to change a life. Thank you, Lowe's for your sponsorship and $5000 donation to help build a home. Next Women Build Set for Saturday, April 30, 2016. Women in Stillwater are invited to help address the need for affordable housing throughout the community during our fifth annual National Women. 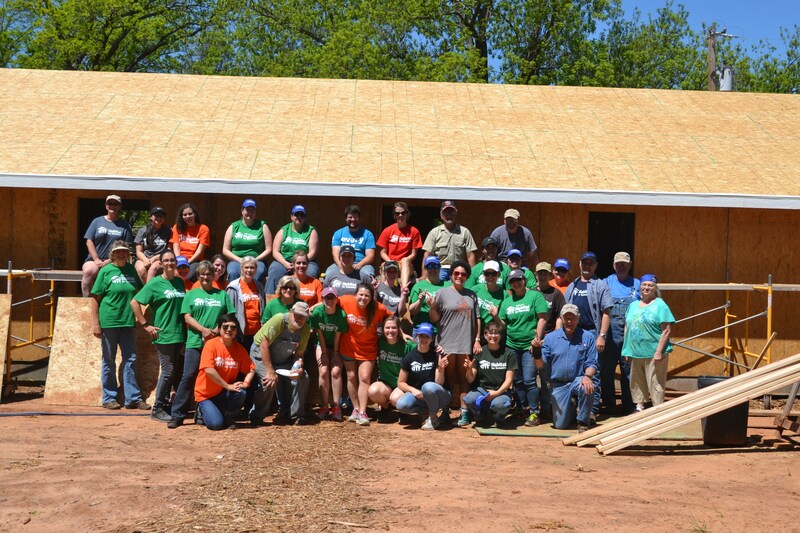 Stillwater Habitat for Humanity is one of more than 300 Habitat affiliates nationwide hosting Women Build projects with support from Lowe’s, Habitat’s longtime partner in the event. Above - Volunteer Brooke Reed hard at work at the 2015 Women Build. On Saturday, April 30th, local volunteers will gather together to work on 2 homes in Stillwater. We will painting the interior of a home for a single mother, building storage sheds, and starting another home. Attendance at one of the following Lowe's training clinic is required if you have not attended one in the past. Tuesday April 26th at 6 pm, the topic is Painting. Thursday April 28th at 6 pm, the topic is Hand & Power Tool Safety. Please RSVP for the clinics to info@stillwaterhabitat.org or 405-377-0403 ext 2 by April 22nd. National Women Build Week, held April 30 through May 7, challenges women to devote at least one day to building simple, decent and affordable housing in their local communities. More than 62,000 women from all 50 states have volunteered in previous years.